Gilde Education offers Dutch language and study skills to current and potential students of Gilde Opleidingen to improve their language level. By filling out this form, a student can be registered for either the Lintschool and/of Summerschool. 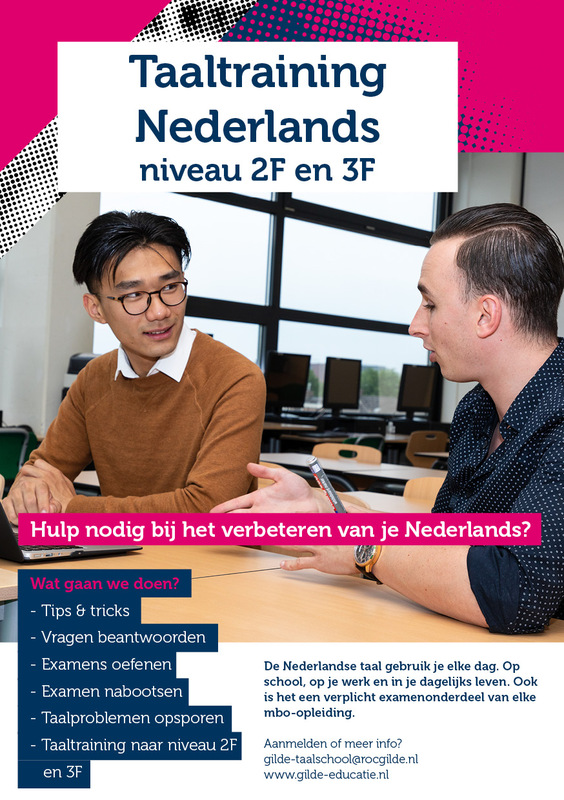 During this schoolyear 2018-2019 Dutch language course is given on the level of 2F and 3F. Also a course of arithmetics is provided. With sufficient participants (at least 6) a group will be started. Beneath the flyers in Dutch. Bredeweg 235: Dutch 2F/3F Monday 3.30 p.m.- 5.30 p.m.
Groenveldsingel 40: Dutch 2F group 1 Tuesday 3.30 p.m.- 5.30 p.m.
Groenveldsingel 40: Dutch 2F group 2 Thursday 3.30 p.m.- 5.30 p.m.
Hagerhofweg 15: Duthc 2F Thursday 2.00 p.m.-4.00 p.m.
Daelweg 6: Dutch 3F Wednesday 12.30 p.m.-1.30 p.m.
Henri Dunantstraat 40: Dutch 3F Tuesday 3.30 p.m.-4.30 p.m.
Drakesteyn 5: Dutch 2F Monday 3.30 p.m.-5.30 p.m.
Lintschool is not without obligations. If you register, classes are compulsory. Signing up or more information? Summerschool in 2018 took place during the last two weeks of the students summerholiday, from Monday 13th up to until Friday 24th August 2018.